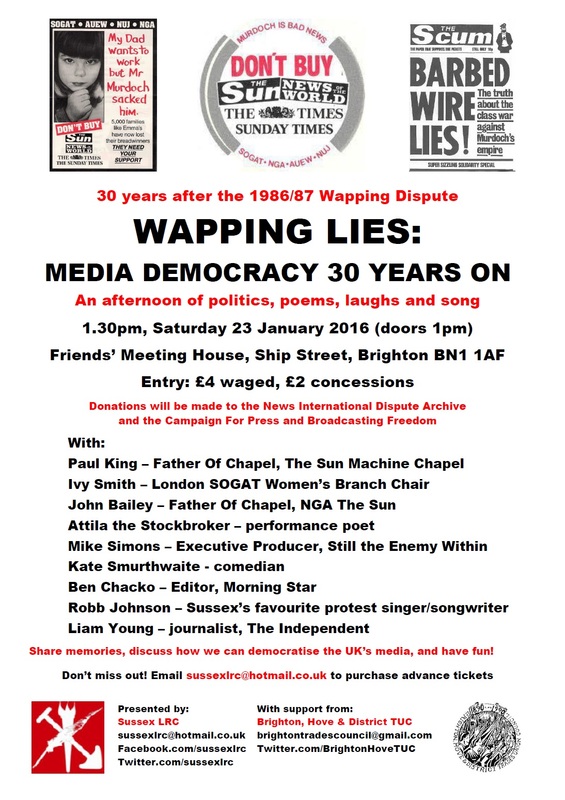 An afternoon of memories, politics, comedy and song as, with support from Brighton & Hove District Trades Council, some great speakers and performers, we mark the 30th anniversary of the 1986/87 Wapping Dispute and link the printworkers’ fight for jobs and justice with campaigns ongoing today. Hear from Paul King – Father Of Chapel (union rep) at The Sun Machine Chapel, local performance poet Attila the Stockbroker, Ivy Smith – London SOGAT Women’s Branch Chair, John Bailey – FOC for the NGA at The Sun, Mike Simons – Executive Producer of Still The Enemy Within and a journalist during Wapping, comedian Kate Smurthwaite, Morning Star Editor Ben Chacko, singer/songwriter Robb Johnson, Independent journalist Liam Young, and others. Doors open at 1pm on the day. Refreshments will be available. As well as remembering the Wapping Dispute, we shall examine how ownership of the media stifles press and broadcasting freedom in the UK, discuss the impact of social media, hopefully raise funds for the News International Dispute Archive and the Campaign For Press and Broadcasting Freedom, and have some fun! You won’t want to miss this great event, so make sure that you buy your tickets early. Contact us to buy advance tickets – just £4 waged, £2 concessions, or to make a donation or sponsor the event. The Wapping Dispute followed within a year of the end of the 1984/85 Miners’ Strike, and was as traumatic an event for the labour movement and the British media. 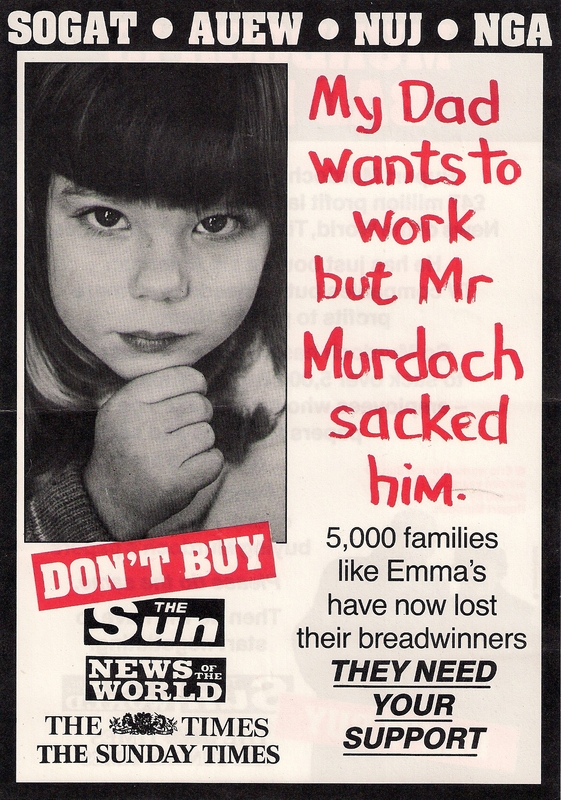 On 24 January 1986, News International Group, which published The Sun, The News of The World, The Times and The Sunday Times, sacked nearly 6,000 staff. Under Rupert Murdoch’s ownership, overnight, News International switched production to a new non-union factory at Wapping, East London. 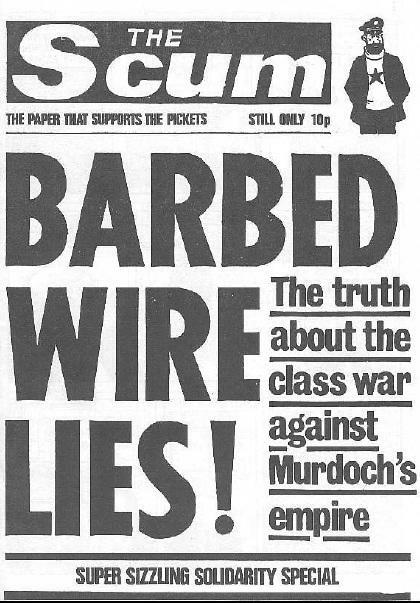 Printworkers and their unions fought for a year but the scales were heavily against them with Thatcher using the state to support Murdoch. The Wapping site was heavily defended by fences, barbed wire and the police. It later transpired that the EETPU had connived with Murdoch in helping to secretly establish the site. This was one of the major reasons for the EETPU’s expulsion from the TUC. Together with the Miners’ Strike, Wapping was a key dispute in the mid-1980s, which Thatcher exploited to introduce anti-union laws and undermine the unity of the labour movement. This is something that can be reversed as Jeremy Corbyn’s leadership of the Labour Party encourages a return of solidarity with the unions. So come along on 23 January 2016 to discuss the lessons of our movement’s past. Meanwhile, the Wapping Dispute 30th anniversary exhibition runs in London until 11 February 2016.